High concentrations of dissolved iron from abandoned coal mines in Pennsylvania have been contaminating some of the commonwealth's streams and rivers for many years, potentially affecting aquatic habitats and drinking water for millions of residents. To combat this problem, a team of Penn State researchers has proposed a method to eliminate much of the iron before it reaches the waterways. 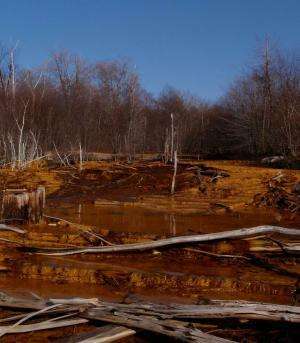 Their research, published in the most recent edition of Applied and Environmental Microbiology, uses bacteria and natural iron "terraces" to remove the iron in a process called biological low pH iron oxidation. "As the water comes out of the ground and runs down the hill, it makes these terraces," said environmental engineering professor William Burgos. "And the chemistry of the water starts to change as iron is removed." Burgos, along with research assistants Daniel Jones, Courtney Kohl, Christen Grettenberger, Lance Larson and geosciences associate professor Jennifer Macalady, discovered that the types of microbes changed as the water ran across the terrace. Certain bacteria, particularly one called Ferrovum myxofaciens, were found to be dominant in locations where most of the iron was removed. This bacteria takes high-acid, high-metal water and turns it into high-acid, low-metal water, making the water less toxic if it goes into waterways and easier to treat if it goes through a treatment plant first. "This process has the potential to improve watershed quality by transforming discharges that would be otherwise considered untreatable," Burgos said. The only tool needed to set up a biological low pH iron oxidation terrace is space. "It doesn't require any microbial seeding because the natural bacteria will develop from the top soil that it runs over," Burgos explained. "So, really, it just requires a little bit of time and land where you want this process to happen." Biological low pH iron oxidation also has a second significant use—re-mining. As the demand for metal increases, there is a lot of interest in re-opening old metal mines, Burgos said. In order to do that, the water has to be drained out of the mine pit and treated. "You have to pump out millions of cubic meters of water that are in these pits," Burgos said. That water is rich with commodity metals. It's also rich in iron, which is not a commodity metal. "If you go to a copper sulfide mine, not only is there a ton of iron, but there's a ton of copper, nickel, zinc, lead… at really high concentrations," Burgos explained. "Because that's what they were mining." Through biological low pH iron oxidation, much of the iron can be removed, leaving only the precious metals. Unlike the natural terrace method, the re-mining of metal mines would be done in an engineered bioreactor due to lack of land space. However, both versions can add a lot of value to the water treatment process. "There's a lot of very interesting potential there," Burgos said. The next step for the researchers is a pilot-scale bioreactor. The team is working with the Pennsylvania Department of Environmental Protection (PaDEP) to create an active treatment solution similar to the re-mining concept. "It's biological low pH iron oxidation, but it's in a sophisticated tank with pumps and blowers and is going to require some operator maintenance," Burgos said.